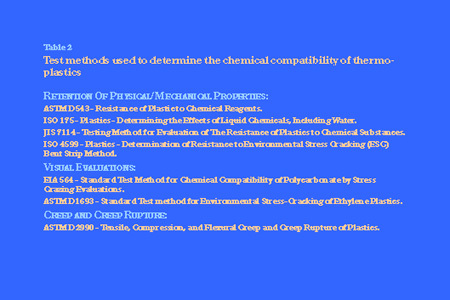 CHEMICAL COMPATIBILITY - Plastics Testing Laboratories Inc. Predicting the Effects of Contact Materials and Their Environments on Thermoplastics Through Chemical Compatibility Testing. By R. James Galipeau, Plastics Technology Laboratories, Inc. Presented before the ANTEC conference, May 1995. It has been observed in the laboratory that failure occurring in parts made from thermoplastic materials can usually be assigned to one of four categories. 4. Incompatibility with contact materials or environments to which the parts are exposed. Part design guidelines and processing conditions are well documented in guides provided by material suppliers. Material selection is based on property requirements for the intended application. The fourth category, compatibility, has proven to be the most ambiguous. One of the reasons for this is the difficulty in choosing a test method that will best predict the effect s of chemicals and their environments on end use products. There are many test methods in use to determine chemical compatibility, each with its own application specific data. By looking at the intended application of the thermoplastic along with the appropriate properties needed for that application, a more informed decision can be made when choosing a test method to determine a material's suitability for its intended purpose. When field failures of Thermoplastic parts occur there are typically four major causes to be considered: Design, Processing, Material selection and Chemical Compatibility. This paper will focus on one of the more common and least understood, that is, the compatibility of thermoplastics with chemical agents. A n understanding of the common theories of chemical attack, the evaluations used to determine chemical compatibility, and the variables to consider when choosing a method to evaluate compatibility, can help an end-user choose the right material for the intended application. The field of chemical compatibility testing is very extensive. The information provided is a review of the major considerations that should be examined when choosing a test method and is a result of years of laboratory observations relating to compatibility testing. It should be understood that no short term test can directly simulate all the environments of a particular end use application. End use testing of production parts is the only definitive method of establishing the suitability of a particular plastic part to a specific application. 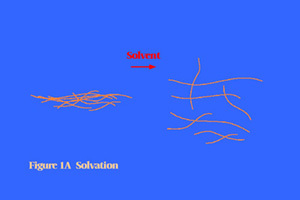 Solvation can be best described as the unraveling of the intertwined molecular chains that make up a polymer causing the polymer to become liquid, where as plasticization is the inter mingling of the "solvent" between the polymer chains causing the polymer to become more flexible. ( If enough plasticizer is present the plasticizer will eventually act as a solvent, conversely if plasticizer is drawn off or volitalized the polymer becomes more rigid.) Figures 1A and 1B. 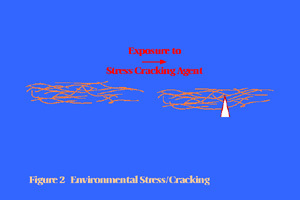 Environmental Stress Cracking (ESC) can best be described as the localized cleaving of portions of the intertwined molecular chains in an area of concentrated stress. Chemicals that will not usually attack a polymer in an unstressed state will attack the area weakened by localized stress causing a crack or craze, the result of the fracture on a micro but not macro scale, with limited breaking of the polymer chains. Polymer separation allows air into clear polymers. Due to the differences in the refractive index of air vs. polymer the fractures are observed as whitening or crazing and cracks on a larger scale. Figure 2. Chemical reaction can best be described as the breakdown of the backbone of the molecular chain of the polymer. The product of the chemical reaction being the lower molecular weight oligameric materials that were used to form the polymer, and other by products of the reaction. Failure occurs as a result of the lower weight molecular weight oligamers not being able to entangle with each other thereby reducing the molecular chain lengths and lowering the strength of the polymers. Figure 3. 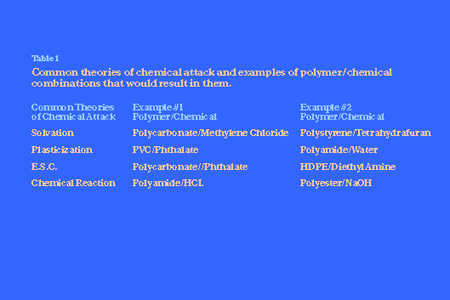 Table 1 provides some examples of different polymer/chemical combinations that result in the types of at tack listed above. A. Retention of physical/mechanical properties. C. Creep and Creep Rupture. Test methods involving the monitoring of physical or mechanical properties are appropriate when any of the three types of chemical attack listed above are being evaluated. Physical properties such as change in volume, weight, dimensions, or hardness are particularly useful when evaluating types of chemical attack associated with solvation or plasticization. Solvation dissolves the polymer, therefore weight loss and softening will occur as the polymer becomes a solute. Tests monitoring the change in weight or hardness would be a good indication of chemical compatibility. 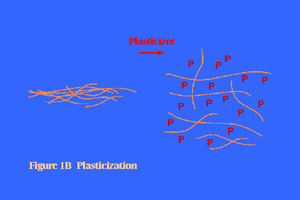 Plasticization allows movement of the individual molecular chains causing the polymer to become increasingly flexible as more plasticizer is absorbed. As in the case with solvation, change in weight, hardness, and in addition, dimension and volume are good indicators of compatibility. A physical property that is very useful in determining the degree of chemical attack by chemical reaction is the measurement of viscosity of the polymer. As a polymers chain lengths are reduced due to chemic al reaction the viscosity changes as the molecular weight changes. Polymer chain lengths become shorter and as molecular weight is reduced the viscosity is reduced. Tests used to measure solution viscosity such as intrinsic viscosity and relative viscosity as well as other capillary type viscosity measurements are all adequate. By recording the viscosity values of an unexposed control and comparing it to viscosity measurements of samples that have been exposed to various chemicals, the degree of chemical attack from reaction can be determined. Although viscosity measurements are useful for a chemical reaction type of chemical attack they are not very reliable for other types due primarily to the differences in the forms of attack. Chemical reactions attack the backbone of the polymers molecular structure changing the molecular weight. The other two types mentioned earlier, solvation/plasticization and ESC, weaken the entanglements or break the molecular chain only in areas of localized stress, therefore, the molecular weight does not change. Mechanical properties such as tensile strength and elongation, impact, and flexural strength can be very good indicators of chemical compatibility. In this type of testing the properties are performed initially and after exposure to chemical agents. Tensile properties, in particular, are affected by changes to the polymer as a result of any of the three types of chemical attack indicated earlier. Plasticization tends to soften polymers, increasing the ductility and thus causing an increase in the tensile elongation while at the same time lowering tensile strength. Please note that the changes that occur are dependent on the amount of plasticizer present and thus results can be affected by other factors. Chemical compatibility effects that can be difficult to determine by other methods such as Environmental Stress Cracking (ESC) can b e readily established by retention of tensile properties. ESC, as discussed earlier, can cause micro crazes invisible to the ey e that only affect the polymers strengths in the area where they occur. Tensile elongation is sensitive to micro crazes and any attack that weakens or cleaves the molecular chain. In response to ESC, tensile strength tends to be lower in cases where stress crazing is very severe but very little change occurs when less severe attack is present. In those cases, tensile elongation is the primary indicator of chemical attack. 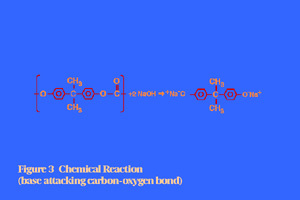 Chemical attack by chemical reaction on the other hand causes decreased tensile strength and elongation in most cases. The degree in which properties change is determined by the severity of the reaction. Visual evaluations can be used in conjunction with almost any test method when determining chemical compatibility and can play an important role in determining the mechanism of chemical attack. One such test method is ASTM D543, which combines visual evaluations with other tests. There are, however, test methods where visual evaluations and ratings are the primary result. Two of these test methods, which are used primarily in determining the degree of ESC, are discussed below. There are basically two types of test methods used when specifically evaluating polymers for ESC. The first, characterized by tests like EIA 564, involves exposing specimens to chemical agents at different levels of stress and temperature for a specific time period. The exposed specimens are then visually inspected for crazing or cracking. EIA 564 specifies the evaluation of clear polycarbonate materials although with modifications the test can be used for other clear polymers. Tests involving visual evaluations for crazing are limited to clear polymers unless the crazing is severe or cracking occurs. This is because microcrazing (t he result of polymer separation and the inclusion of air between the polymer chains) can only be seen as a whitening in clear polymers, opaque polymers inhibit the transmittance of light necessary to detect the small crazes. Minute crazes which could cause mechanical failure are difficult to detect in opaque materials, therefore, test methods involving mechanical tests are better suited for opaque materials. The second method, ASTM D1693, is designed for use with ethylene type plastics and involves bending test specimens in a fixture, nicking the specimens to initiate a controlled imperfection, and then applying chemical agents. The specimens are then evaluated for crack growth and results determined based on the number and severity of the cracks. ASTM D1 693 is limited to flexible materials, primarily opaque, and to the observance of cracking. Microcrazing beneath the surface cannot be detected. Test methods involving Creep and Creep Rupture can be used to evaluate chemical attack by any of the mechanisms described earlier. Creep can be a very good indicator of how a polymer will behave under specified conditions of environment and load after exposure to various chemicals. One example of a test method used for determining Creep and Creep Rupture of polymers is ASTM D2990. This test method involves subjecting a test specimen, flexural or tensile, to a constant load and environment. Chemicals are then applied and the time to failure or change in strain over time is recorded. Monitoring the change in strain or time to rupture of a chemically unexposed control and chemically exposed specimen (under identical conditions of load and temperature) can provide data that can be used to determine how a polymer will behave mechanically and dimensionally when exposed to the chemical being evaluated. The results can also provide insight into how the material will behave over time when in contact with the chemical being evaluated. Polymers can exhibit elastic deformation and reduction in strength when solvation/plasticization occurs. Creep measurements are therefore useful in determining compatibility with solvents or plasticizers. Chemical attack by Environmental Stress Crazing/Cracking can similarly be determined b y Creep rupture and/or measurements. This is because polymers weakened by microcrazes, crazes, or cracks will tend to have a shorter time to rupture and a lower strain measurement than a comparably stressed control. Creep and Creep Rupture can also be use d to determine compatibility when the mechanism of attack is by chemical reaction. Results can vary depending on the severity of the reaction. If a severe reaction occurs the time to rupture will be very short and strain measurements low, as with a brittle failure. If the reaction is not severe, the material may not exhibit any deformation and no failure at the load in which the test is being performed. In this case, the results should be interpreted according to change vs. the control and other testing, such as viscosity measurements, performed. When choosing a test method there are many variables that must be considered in order to provide the most meaningful data. In most cases variables such as test temperature, exposure time, chemical application , and applied strain are determined by the intended application of the polymer. In other cases variables are determined by the polymer, such as the solvent to be used for solution viscosity. 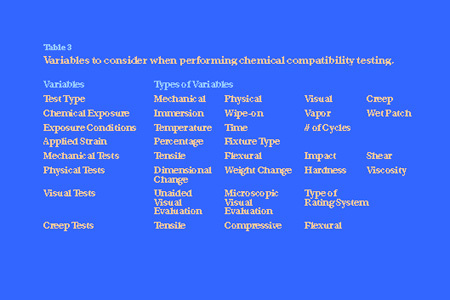 Table 3 list s some variables to consider when performing chemical compatibility testing. Because of the wide variety of test methods and the variables specific to each, an understanding of the polymers end use application is desirable when determining the test method that will provide the most meaningful results. Conclusion Predicting the effects of chemicals and their environments on thermoplastics requires a thorough understanding of the mechanisms of chemical attack along with the test methods appropriate for evaluating those mechanisms of attack. By looking at the intended application of the polymer and the associated physical and mechanical property requirements , a test method can be chosen that provides the data necessary to make decisions as to the compatibility of a thermoplastic material with its end use environment. As with any compatibility testing, the results correspond to specific performance under specified test conditions and the testing of actual production parts provides the only definitive measure of field performance. Acknowledgements The author would like to acknowledge the assistance of Mr. Richard J. Kondel in the preparation of the manuscript and figures.